Imogen's Typewriter. : Guest Post: A Reading Challenge with a Difference! Guest Post: A Reading Challenge with a Difference! Hello friends! My name is Siobhan and I write a lifestyle blog over at That’s What She Writes. I write about everything from food, travel and book reviews, to life and blogging advice. I’ve known Imogen for a few years now after meeting her at a few events and following each other’s blogs since, so when Imogen asked me to write a guest post for her of course I said yes! I’ve really gotten into the idea of self-help books this year and have picked up a few for myself. I’ll be totally honest and admit that I’m an incredibly materialistic person, and I absolutely hate that aspect about me. I don’t want to spend my life lusting of things, because there’s always something else that comes along that you don’t have and convince yourself you need. Instead I want to spend my life smiling at the happy memories and moments I have made instead. It’s something I’m working on, but it’s tough, which is why I think this book will really help. Gerad Kite believes we are making ourselves ill with our material lifestyles. He believes we are unhappier than we have ever been, and this is because we have lost the ability to tap into our inner selves. With this book, Gerad Kite intends to help us view things from a different perspective, and to help us see that everything we need to be happy we already have inside of us. Unlike a lot of people, I really don’t mind reading a book after I’ve seen the film. The way I see it is that the book is always so much better than the film, so I’m not going to be left disappointed! I went to see Warm Bodies a few years ago when it first came out at the cinema. I knew nothing about it apart from the fact that the main guy was the kid from About a Boy. I left the cinema pleasantly surprised at how good it was, and immediately went and bought the book. It’s since been sat on my TBR pile untouched, yet every time I see it I think ‘I really should read that’. This year I’m actually going to stand by my word and do that. Warm Bodies focuses around ‘R’, a zombie who is a little different from his fellow dead. He has no pulse or memories just like the other zombies, but he does have a dream. One day he meets Julie, one of the living who brings light and colour into his grey and dreary World, and instead of eating her, he decides to save her. From there a strange yet tender relationship between the two unfolds. Anybody who knows me knows I’m a child trapped in an almost 30 year olds body. Two of my all-time favourite things are Disney and Harry Potter, and I’ve seriously been having a Harry Potter moment since first visiting the studios last year. To keep the magic alive I’ve been re-watching the films and re-reading the books until my next visit at the end of May. I feel like 2016 is the year to see what J.K. Rowling’s writing style is like outside of the Wizarding World though. I’ve had Casual Vacancy sat in my TBR pile for a while, but I’ve been a little apprehensive about reading it. I think my love for Harry Potter is so strong that I just don’t want to be let down by her other work, but I’m just going to bite the bullet and go for it, and hopefully be left happy! Casual Vacancy is about the people of a small town called Pagford. When one of the residents of the town, Barry Fairbrother dies in his early fourties the town goes into shock. With Barry’s death an empty seat is left on the Parish Council, and with that the biggest war that there has ever been in the town is created. A war over who will be elected to fill the seat, filled with passion, duplicity and unexpected revelations. I few years back I was bought a variety of classic novels. I’d wanted to get my nose stuck into some classics, but in all honesty I’m yet to read even one of them. They intimidate me, and I worry that the time they were written and the style of writing will go over my head. However, I have to keep reminding myself that they’re classics for a reason! I recently saw Pride and Prejudice and Zombies at the cinema and loved it. I knew I wanted to read the book adaption, but not without reading the original first, so I’ve promised myself that this year is the year I will read my first Jane Austen book. The book focuses around Elizabeth Bennet and Mr Darcy. Elizabeth has to learn to look beyond her prejudice and swallow her pride towards Mr Darcy as she slowly learns the truth about him, and as a result opens herself up to the desires of her heart. This year I have made a promise to myself that I will broaden my reading horizons and pick more books in genres that I wouldn’t have usually picked in the past. 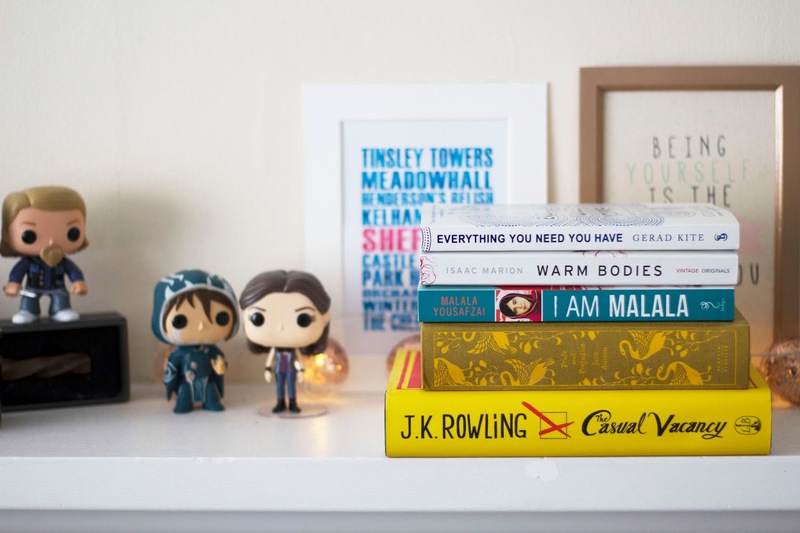 I Am Malala is certainly not something I would have picked up for myself, usually opting for fictional stories where I can escape into new Worlds for a few hours. I had heard rave reviews about this book though, and being a sucker for an inspiring story I thought it would be worth a read. Malala Yousafzai is the youngest ever winner of the Nobel Peace Prize after she fought for her right to an education. On October 9th 2012, Malala was shot at point blank range, and nobody expected her to survive. In this book Malala Yousafzai tells her story and shares with us her journey. There are many more books on the list; these are just my starting point. My aim this year is to diversify my reading material. We can learn so much from reading, both fiction and non-fictional books, and I want to read as many of them as often as I can! Have you set yourself a reading challenge this year? What books are on your TBR pile?